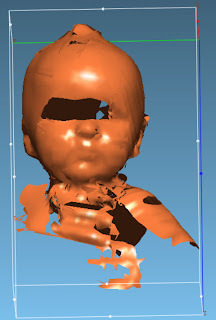 Check it out, Colin imaged in 3D! It was cooler on their application, the guy could "spin" the image around. I just got a screenshot of the image. Honestly, we're happy to have it done and excited to get it over with. Colin has had a flat spot in the back, left of his head since about 3 months (positional plagiocephaly) and we were initially told it was mild and he should grow out of it. But now, the flat spot is starting to push one ear and one side of his forehead forward. After second, and third, opinions, we finally got a prescription for the helmet. It's clear he's not growing out of it. We tried repositioning him to no avail. We think he had a major growth spurt at an inopportune time, and therapy isn't helping, so he'll be donning a cranial remoulding helmet in 2 weeks! So, certainly, more pics to come in two weeks when Colin gets his headgear! We picked out a blue one and can't wait to decorate it! Jenson and Luke had flat spots, too! I hear it is especially prevelent in twins and boys for whatever reason. Our pedi noticed it at eight weeks and I tried repositioning for a month...what a joke! We BARELY made the cutoff for the head cups at 12 weeks (but since they were premie I convinced them to let us try for a few weeks while we waited for a helmet appointment) and it worked great, so we never moved on to the helmet...but I totally would have! the sad thing is that the head cups are $120/each out of pocket...yet most pedi's (including mine) don't tell you there is another option if you catch it early! I only found out through the MMOTA board!